If you haven't already figured by now, Christmas is my absolute favorite﻿ time of the year (yes I know I'm a living, breathing cliché) but seriously - the twinkling lights, the smell of pine trees, the piping hot chocolate, the rosy cheeks and general uplifted spirits all around, it's just so hard to be a Grinch. 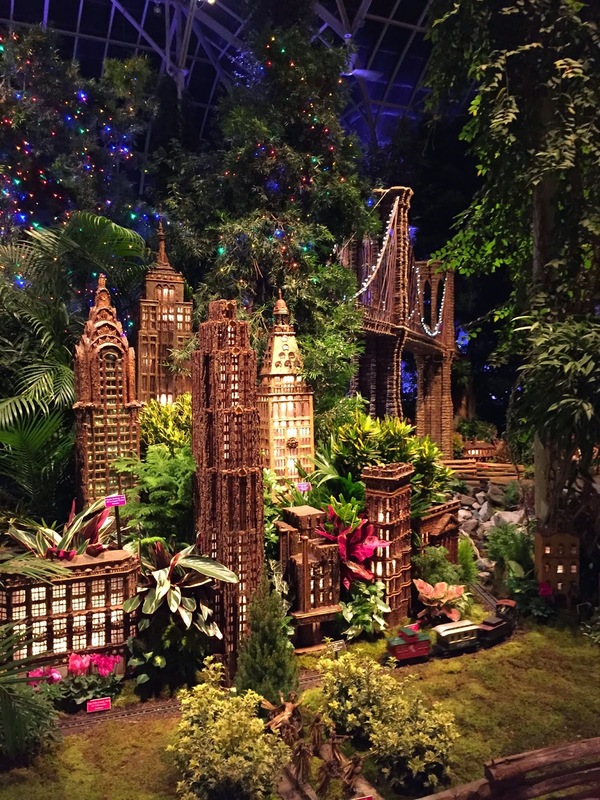 A couple weekends ago, I went to the Holiday Train Show at the Bronx Botanical Garden and it was... magical. They have basically built a miniature NYC in the greenhouse complete with choo choo trains running through the entire space. I cannot recommend this place enough - it gave me the same tingles I got when I first saw the fireworks at Disneyland as a kid. Granted, I went at night when the show was about to close so there was no line and only a few people roaming around. But from the set up and with the reviews I've read, it does get pretty packed during the day and I can see how it could take away from the experience. So if you do decide to go, I would recommend going at 8:30 / 9 pm. It will give you an hour or so before the guards kick you out of the greenhouse. And by that time, there are so few people around, you can even pop a squat and stare into those dreamy little buildings for as long as your heart desires. Going at night also makes the place that much more romantic and magical (oh the power of fairy lights) - they even have fire breathers (which you've got to admit looks that much cooler at night than during the day)! I'd recommend taking the MetroNorth from Grand Central ($6.25 one way) as that drops you off right in front of the gardens. Otherwise, the 4, B or D subway will get you within walking distance as well. It took us less than an hour to walk through the entire greenhouse as there was no line, but it could take significantly longer depending on the crowd. For the Great information you write it very clean. I am very lucky to get this tips from you.very well information you write it very clean. I’m very lucky to get this information from you .. Awesome view, thanks for sharing.